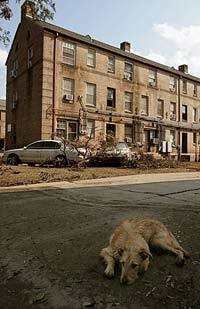 Juste photographed the stray in September while in New Orleans covering the aftermath of Hurricane Katrina. Miami Herald staff photographer Carl Juste was working in storm-ravaged New Orleans last year when he spotted a tawny-colored mutt. 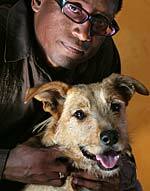 He photographed the stray for a story about abandoned pets. The timid dog with a wiry terrier body and light brown chin hairs followed Juste around on his assignments for almost two weeks. When it came time to return home, Juste couldn’t bear to leave the dog behind. He canceled his flight and drove a rented SUV home with Kane, who slept on Juste’s leg and shared beef jerky all the way back to Miami. Today, the New Orleans orphan shares Juste’s home with four cats and two other dogs. He has adjusted well to life in South Florida, where he enthusiastically chews on coconuts and palm tree branches, says Juste.